I have occasional nights where I have trouble falling asleep. I toss, I turn, try watching old sit-coms in a futile effort to drift off to sleep, but to no avail. That's not a good thing when you have a busy schedule the next day, as I often do. 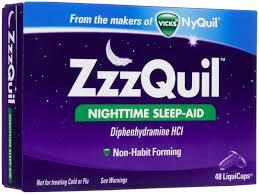 I was sent a package of ZzzQuil Nighttime Sleep-Aid to try out. This is not a cold remedy, this is simply to help you fall asleep. It really does the trick. Not tossing and turning, just peacefully drift off to sleep. The active ingredient is diphenhydromine. It is safe, non- narcotic, and non-habit forming. Perfect for the nights you just can't fall asleep. I woke up feeling well rested, not groggy or in a fog. This is a great product to keep on hand.